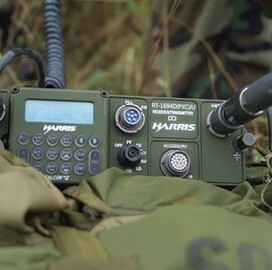 Melbourne, Fla.-based communications technology maker Harris Corp. (NYSE: HRS) has agreed to purchase defense electronics manufacturer Exelis (NYSE: XLS) in a cash-and-stock transaction with an enterprise value of $4.75 billion, or $23.75 per share, the companies said Friday. The price of the deal — Harris’ largest acquisition in company history — is a premium of 34 percent to Exelis’ Thursday closing price of $17.71 per share and puts the McLean, Va.-based company’s outstanding shares at a value of nearly $4.4 billion. This announcement comes nearly four months after Exelis spun off its government services business to create a new publicly-traded company named Vectrus (NYSE: VEC) as Exelis sought to focus more on its networks and information systems lines of business, among other areas. Harris said the deal has a closure date of June 2015 and is subject to the approvals of regulatory bodies and Exelis shareholders. The boards of directors at both companies unanimously approved the transaction. Harris shareholders will own approximately 85 percent of the combined company and Exelis shareholders would own the remaining 15 percent. Exelis shareholders will receive $16.625 in cash and 0.1025 Harris shares for each share held in Exelis. Both companies estimate the combined entity would have had close to $8 billion in pro forma revenue for calendar year 2014 and have nearly 23, 000 employees worldwide. Exelis said in its fiscal year 2014 second quarter earnings release that it expects to see $3.25 billion in revenue for the full year and Harris reported $5.01 billion in revenue for its full 2014 fiscal year. Harris said it expects the deal to slightly increase its earnings in the first full year after closure and become a more significant contributor after. The company also has identified pretax cost synergies of between $100 million to $120 million through a consolidation of headquarters and other cost reduction moves and expects savings to achieve an annual run-rate in year three. Harris also reported its fiscal year 2015 second quarter earnings Friday and said its government communications systems segment posted a 5-percent increase in revenue from the prior year period. That is the fifth consecutive quarter the segment recorded a year-over-year revenue growth, Harris said. Harris’ stock closed Thursday at $69.49 per share, up 1.18 percent from Wednesday’s figures.